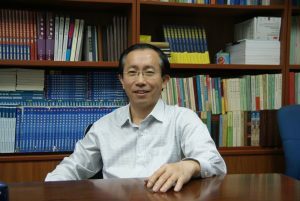 Zhanganghan Han is a professor and the associate dean of School of Systems Science, Beijing Normal University (BNU), China. He is the founding director of Systems Analysis Lab at BNU. He got a B.A. and a M.S. in Statistical Physics from BNU. He got his Ph. D. in Artificial Intelligence from the Mathematical Institute of the Academy of Sciences, China in 1997. He worked as researcher at Solvay Institute, Brussels Free University (ULB) and University of California at Los Angeles (UCLA). His research interest is focused on modeling complex systems in a variety of areas. He specifically solves problems in real world self-organization systems with agent-based modeling and evolutionary algorithms. He is currently working on the cost of greenhouse gas emissions.